Anyway, just this week I've had a couple of comments on this post from other women who enjoyed the magazine but, for one reason or another, have missing copies with missing favourite recipes. I couldn't help out Maggie with a Dutch Apple Cake recipe, but I may have the Black Forest Gateau recipe that Diane6 was looking for. 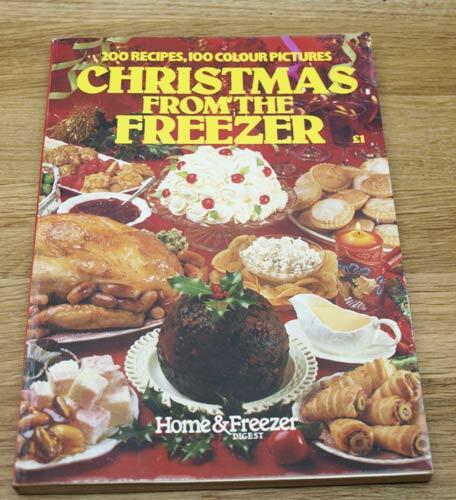 I think this little book was the first one that I got from H&F Digest, it was invaluable for looking up how to freeze different foods, whether they needed blanching and how long you could keep them in the freezer. This was the first Christmas from the freezer book and it has lots of great ideas to help you get ahead , I certainly made quite a few things from this book. 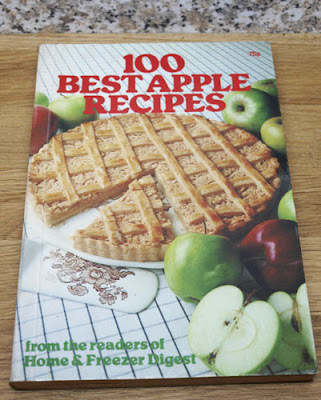 This little book is well thumbed and has some great recipes that I have made a few of them a number of times, the Apple Pickle recipe is particularly good. 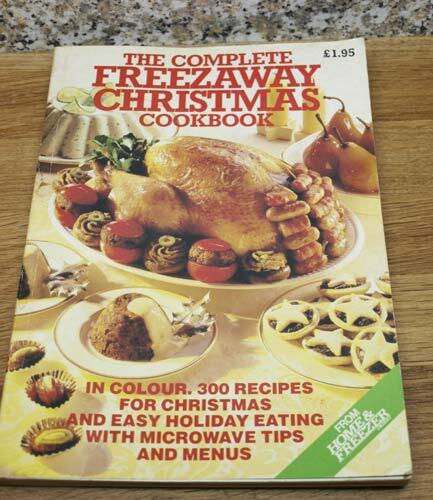 Going by the price this is the last of the books, it has some of the same recipes as the first Christmas book, but lots of different ones too. And so to the Black Forest Gateau, there are two different recipes in the two Christmas books, so I am including them both and hope that one of them is the one that Diane6 is seeking. 2. Separate eggs. Sift together flours and salt. 4. Add melted chocolate and egg yolks, beat well. 5. Whisk egg whites stiffly. Fold four into mixture, then the egg whites. 7. Cool cake in the tin, then turn out. Whip cream. Split cake in two. 8. Spread with black cherry jam, then a third of the cream. 9. Sandwich cake together. Spread a second third of cream smoothly over top. 10. Fill remaining cream into piping bag and pipe 8 rosettes on top of the cake. To serve now: grate block of chocolate on cheese grate to make curls and arrange on cake. Take 8 cherries out of jam if possible and place each on a rosette. To freeze: freeze until solid, then pack in a container, seal, label. Use within 3 months. To serve from the freezer: thaw overnight in the fridge covered. 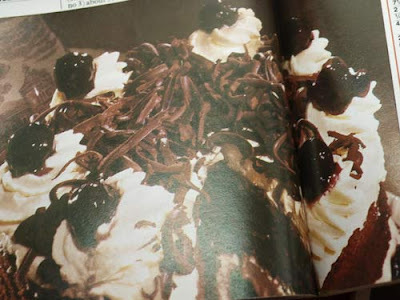 Top with chocolate curls and cherries. 1. Make base: cream butter and sugar. Stir in flour. Knead lightly till smooth. Press 3in (7.5cm) wide strip of shortbread into the length of a greased 7 x 10 3/4 in (18 x 27cm) tin. Prick over with a fork. Bake (325F, 190C, Gas 5) 15 mins. Cool 5 mins in tin. Turn out on a wire rack. 2. Make sponge: sift dry ingredients into a bowl, add fat and eggs. Beat together till smooth. Spread in same tin, greased, lined. Bake as above 25 mins. Turn out on to wire rack. 3. For filling: drain cheries, reserving juice. Blend 4 tablesp juice with arrowroot in a pan, boil till thick and clear. Add 1 tbsp kirsch and all but 8 cherries, cool. Mix remaining kirsch with 3 tabsp reserved juice, set aside. 4. Make decorations, grate half the chocolate into curls, using a potato peeler. Reserve. 5. Melt remainder in a basin over a pan of hot water. Dip leaves in chocolate to coat the leaf tops only. Leave to set. Cool remaining chocolate. 6. Whip creams together to a soft peak. 7. Assemble cake, spread jam over the shortbread base. Cut the sponge in half lengthwise, then split each piece and trim to give four 3 x 10 in (7.5 x 25 cm) strips. 8. Place one strip on top of shrotbread. Sprinkle with half juice mixture. Spread some cream over. Place second strip on top. Spread with cherry mikxture. Place third layer on top, sprinkle with remianing juice mixture, then spread with more cream. Place final layer on top. Trim shortbread. 9. Add cooled chocolate to rest of cream. Place 3 tbsp in a piping bag fitted with as star tube. Smooth remainder over top and sides of cake. Pipe a zig-zag rope down the centre of the cake. 11 Carefully peel leaves away from chocolate arrange with the cherries down centre of cake. To serve now: place on serving plate. Slice. 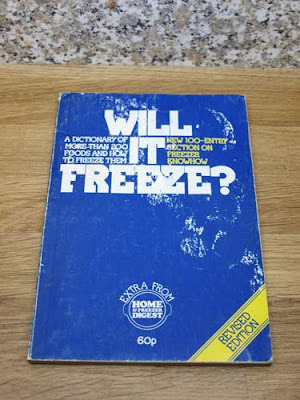 To freeze: open-freeze till sold. Pack in a polybox. Label, use within one month. To serve from freezer: place on serving plate. Thaw 3 hours in a cool place. I haven't made either of these, but the quality of the recipes in H&F Digest is similar to that of BBC Good Food, I have never had a problem with them. I hope you enjoyed this little bit of 80s cooking. Labels: Black Forest Gateau, Home and Freezer Digest. 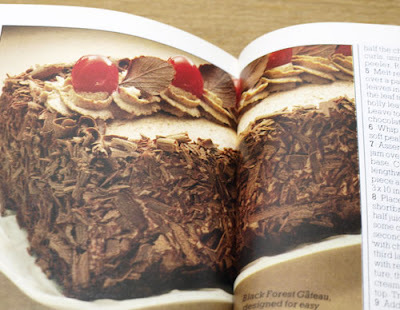 Those are brilliant - funny how food styling moves on but we still crave those recipes, isn't it?